Sometimes comfort food is in order and apple pie is definitely a comfort food to me. There has been a lot going on around the house here lately and easy desserts are something I am really interested in right now. One of the great things about this dessert is that it's a multitasker. What I mean by that (because I know you're looking at the screen saying "what?") is that I served some of the apples as a side dish with dinner (you will see that dinner on Monday) then we had the other two servings for dessert...with the ice cream and graham crackers. As everyone knows I love coming up with other flavor combinations for the recipes I try. 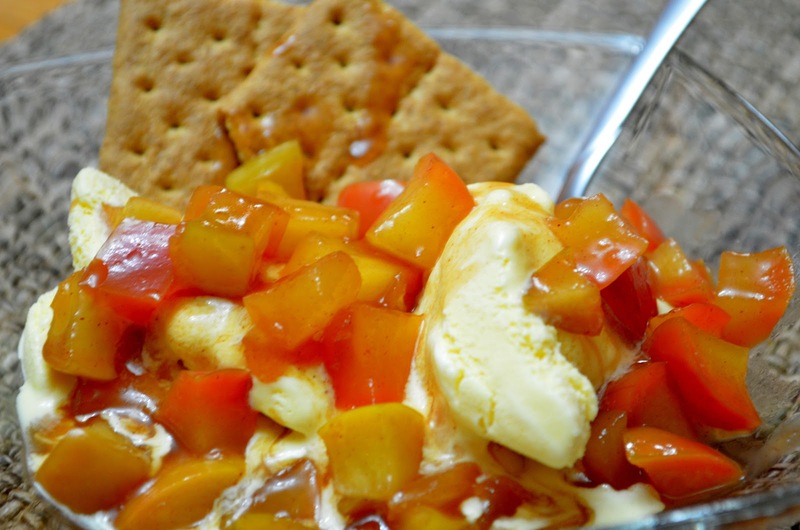 I'm confident that pears would be wonderful in this recipe, or even peaches. Blueberries may be delicious too. Maybe one time I will get really wild and try some mixed grapes...that sounds delicious to me. I bought a big box of graham crackers at a wholesale club and have been eating them all the time. I sort of love them. One of my favorite ways to have them with with peanut butter and chocolate chips in between two pieces, then microwaved for about 10 or 15 seconds to melt the chocolate and peanut butter a little. It helps the chocolate craving and keeps portion control in check. We usually serve our ice cream in bowls half this size but these apples called for a bit of a larger indulgent serving. I had fun dipping my graham crackers into the ice cream and apples then eating them as though they were a spoon. You could of course serve this with cinnamon graham crackers too and that would be delicious. 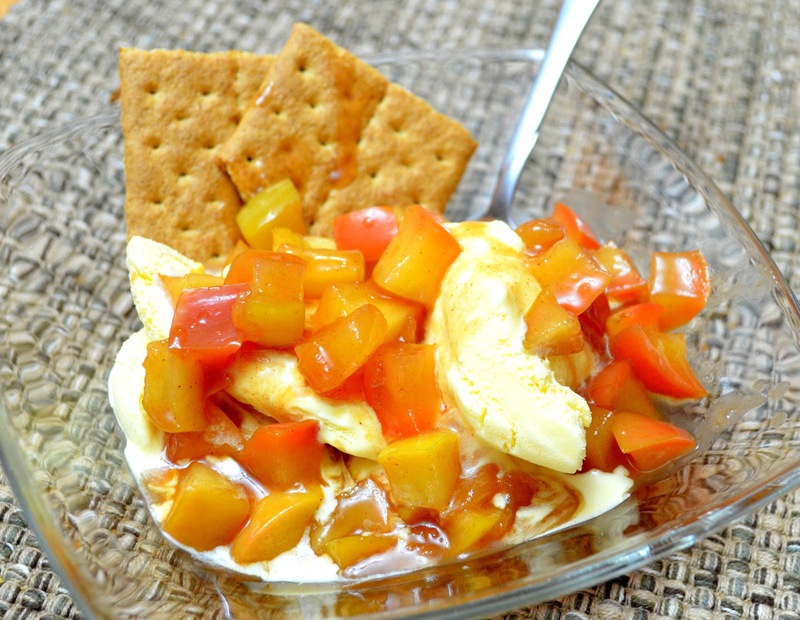 Another alternative would be to layer the ice cream, apples, and crushed graham crackers in a glass like a parfait. That would be pretty. But this is about being a quick dessert recipe and I'm sure I could sit here all day with ideas of ways to change it up. But, you should probably just see the super easy recipe for when you have a pie craving but don't want to make pie :). 1. In a medium saucepan over medium heat, melt the butter. Once the butter is melted, stir in the sugars, cinnamon, and water. Bring the mixture to a boil and let it boil for 2-3 minutes. 2. Reduce heat to medium and stir in the apples. Cook for an additional 2-3 minutes, stirring occasionally, until apples are softened slightly. Remove about 2 tablespoons of the liquid from the saucepan and pour into a small bowl. Whisk in the cornstarch until blended and smooth, then add the mixture back to the saucepan. Bring to a boil for 1-2 minutes or until the mixture is thickened. 3. Pour the apples over the ice cream in the small bowls. Serve with 1 graham cracker in each bowl and whipped cream, if desired.